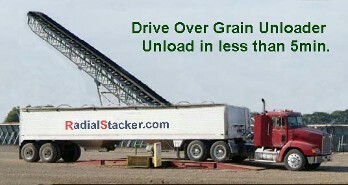 Drive Over Grain Unloaders $34,995.00 allow for the rapid unloading and storage of product without the need to rehandle. Lower Operational Cost + Less Time = More Profit. From field to truck and then? Drive Over Grain Unloader is the answer to simple, cost effective way to unload grain. Need to unload fast at a low cost? We can help! Load in the Field, Unload at the Bunker. 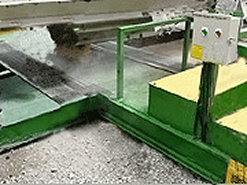 Drive Over, Open hopper and the grain flows out and onto a stacking conveyor. Simple, cost effective, grain transfer. This is the Light Duty Grain Base Unit. It is in stock and ready to be shipped. Attach Ramps, Connect to Line Power, Drive Over and Unload. (Grain Stacker Sold Separately). Now you can constantly unload with the Double Drive Over Grain Unloader. As one truck unloads, the next sets up to unload. Drive On, Open Up, and Unload. The HD Unloader is made for continuous duty. NEMA 4 Digital Soft Start for long life, 25hp Motor with optional flip up hopper. Double Drive Over Unloader. Never have an empty belt again! One truck is unloading while the next is setting up. Cost Effective, Efficient, and FAST!